The Kentrosaurus (KEN-truh-SAWR-us) is one of the Creatures in ARK: Survival Evolved. While Kentrosaurus aethiopicus is considerably smaller than its close relative, Stegosaurus regium, it is much more formidable in matters of self-defense. In fact, it is arguably the pound for pound champion of not only the Stegosaurus, but when encountered in close-knit fighting packs, ranks atop the Island's herbivorous dinosaurs in general. 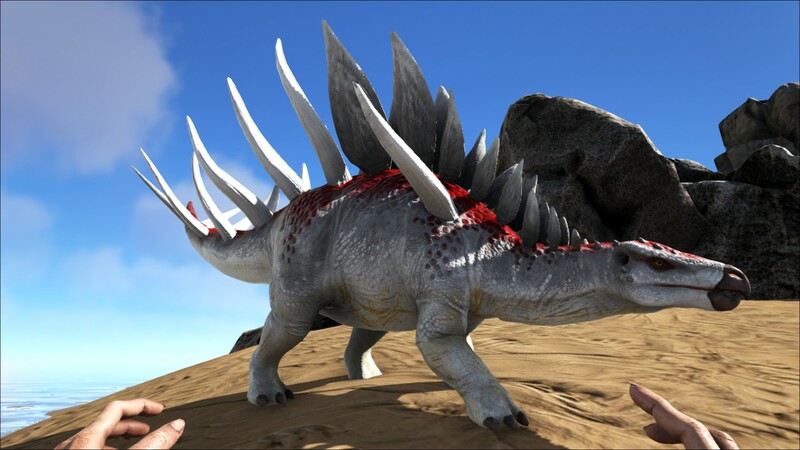 Thanks to its wickedly sharp defensive spikes, any creature that attacks Kentrosaurus is likely to be reversely wounded in turn, and it is capable of piercing even the thickest of hides and armors when it goes on the offensive. I have personally witnessed the Kentrosaurus fell much larger predators in a single such "impaling" maneuver! Underestimating Kentrosaurus can be a fatal mistake, particularly when it is in a herd. When travelling in numbers, Kentrosaurus seems to grow much more aggressive, increasing the range at which it will defend its territory. Survivors have seen little success in their attempts to ride Kentrosaurus, owing to its spikes and hot-headed temperament. However, a tamed herd of Kentrosaurus can effectively defend a compound and take on larger carnivores. Once impaled by its attack, the Kentrosaurus slams the attacker on the ground continuously, helping to turn the tide of a pitched battle! Kentrosaurus is a very defensive and territorial herbivore. Although it tolerates wild herbivores, it will attack survivors and tamed dinosaurs that come close to it. It also gains a pack bonus from others nearby, similar to Allosaurus and Compies. Approach with extreme caution, as its bleeding attacks can be devastating, especially with the herd bonus. Kentrosaurus is a smaller, stockier relative to the more famous Stegosaurus. Its body is similar to Stegosaurus, with a low slung head with a beaked mouth, close to the ground to feed on low growing vegetation. It has a double row of plates up to its pelvis and a formidable double row of spikes down its tail, its main form of defense. 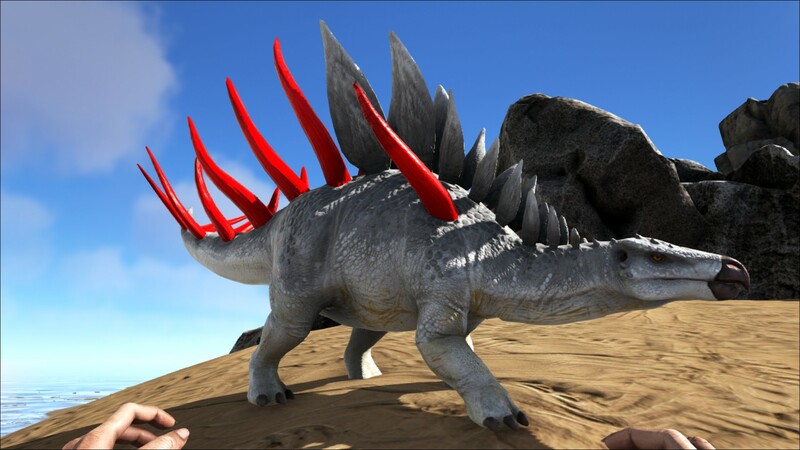 In addition, it has a pair of spikes on its shoulders to deter attackers from the sides. This section displays the Kentrosaurus's natural colors and regions. For demonstration, the regions below are colored red over an albino Kentrosaurus. The colored squares shown underneath each region's description are the colors that the Kentrosaurus will randomly spawn with to provide an overall range of its natural color scheme. Hover your cursor over a color to display its name and ID. For example, "cheat SetTargetDinoColor 0 6" would color the Kentrosaurus's "main body" magenta. A single wild Kentrosaurus will not attack unless one almost walks into it. However wild Kentrosaurus are herding creatures and gain a bonus from others nearby, this pack bonus will make them increasingly territorial with every additional wild Kentrosaurus. Starting from a group of two, they will attack any tamed dinosaur or survivor that come close to them. It is best to keep a distance and kite the Kentrosaurus with ranged weapons. Be on the look out for the highest levelled dinosaurs and try and take them out first. Ranged weapons or large dinosaurs that can resist its latch attack and tank its bleed damage such as Rexes. The Kentrosaurus can pick up the player using its main attack into its tail spikes, as well as applying the bleed effect. Although the Kentrosaurus will drop the player after some time, its attacks can still be devastating to even the strongest of players. Because this creature seems to reflect a certain percentage of damage, using a tamed Giga against them is ill-advised. This will result in a massive reflection and an almost instantaneous filling of the Rage Bar. They have low torpor and can fall easily under tranq arrows or darts. This will make taming or killing them much easier if you don't have any hunting dinosaurs. They are also fairly slow, so it is not too challenging to evade them. Note: Contrary to Jen's post about 257, testing and devkit data show that the Kentrosaurus does not prefer Savoroot over other crops. It cannot impale unconscious and alpha variant dino. The dossier was revealed on September 5, 2016. ↑ Introducing the Kentrosaurus & A Message to the ARK Community!